Diversity and inclusion mean different things to different generations, according to a recent study by Deloitte and the Billie Jean King Leadership Initiative (BJKLI). The study found that Millennials think of diversity as the blending of different ideas, backgrounds, and experiences within a team. This is called “cognitive diversity.” Inclusion is about leadership support for a collaborative environment that is transparent, communicative, and that welcomes different perspectives. Compare this to the traditional Boomer and Gen-X definition of diversity that focuses on fairness and protection for all, regardless of protected class status. Inclusion is about morality and legality; providing access for everyone because it is the right thing to do. As millennials enter the workplace in greater numbers, what does it mean for organizations to support inclusion and cognitive diversity? What will happen if leaders continue to focus on traditional definitions? We will soon be leading organizations with many members who want to bring all of their differences to the table, and to openly discuss differing viewpoints and the experiences that shaped them. According to the study, 86% of millennials feel that differences of opinion allow teams to excel, but only 59% believe their leaders share this point of view. 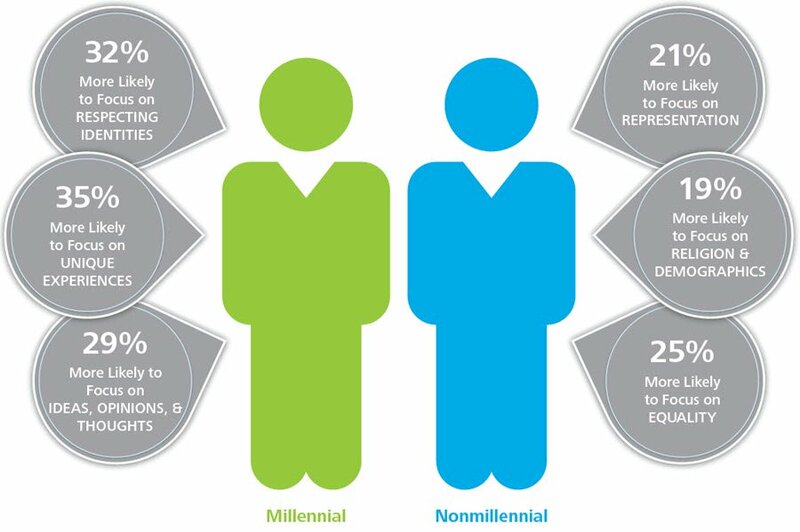 And when they don’t believe an organization’s culture is inclusive, millennials are likely to be dis-engaged. What does this mean for your institution? How have you included cognitive diversity and open communication in your diversity plan? This entry was posted in building teams, Diversity, leadership challenges and tagged diversity, higher education, Leadership. Bookmark the permalink.